On a trip to the American Hosta Society Convention in Nashville I was amazed to see massive specimens of hostas growing in all kinds of different containers. In fact, in many of the gardens the hostas were almost entirely grown above ground. In Nashville it was done because of the constant threat of vole damage when the hostas were grown in the ground. 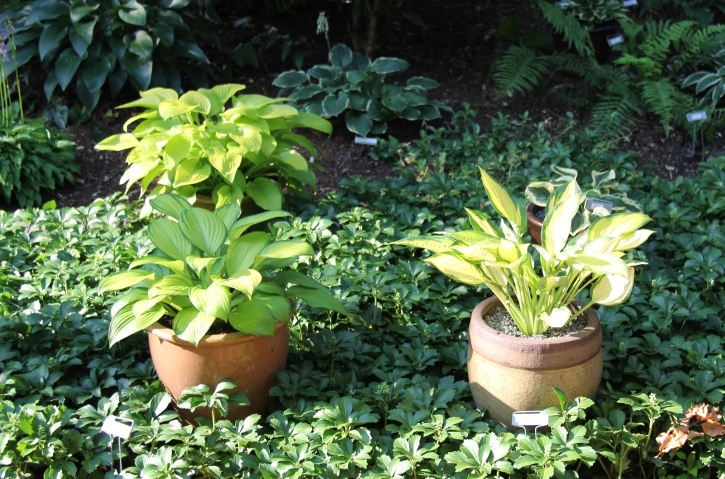 It is also easy to handle hostas in containers there because the hostas can be left in their containers all year round. While I am not about to uproot our entire hosta garden and transfer them to containers I love the look of a well grown hosta in a container. Hostas in containers add drama to a garden. Areas that are heavily filled with tree roots can be planted with groundcovers and hostas in containers can add much needed colour and a three dimensional look. On a shady patio or deck a grouping of hostas combined with other shade loving perennials and annuals can be every bit as colourful and attractive as a pot of annuals. A beautiful pot with a perfectly grown prized hosta specimen can showcase that hosta better than any spot in the ground. To grow hostas successfully in containers you need to deal with three issues, soil selection, fertilizing and watering. A high quality potting mix that drains well yet retains moisture is essential for success. Don't skimp on the quality of the mix. You have bought good quality plants so don't cut corners by using poor quality mix. You can't use regular soil in the container even if it is bagged top soil. A potting mix that contains composted pine bark is highly recommended but can be difficult to find. Some experts recommend adding extra drainage from coarse chicken grit. If a sopping wet handful of mix will crumble in your hands it has sufficient drainage. Fertilizing will necessitate the use of a slow release fertilizer designed for containers. The fertilizer should be applied to the soil surface and scratched in each spring just as the shoots start to poke out. Many hosta experts also suggest a regular application, until mid summer, of a foliar fertilizer that the plant absorbs through its leaves. The most difficult part of growing hostas in is the necessity to water regularly during the heat of summer. If you let container soils dry out they can become very difficult to rehydrate especially if they are heavily peat based. If the potting mix drains well you can't overwater because any excess will just drain away. Air is also forced into the pot every time you water and air in the soil is essential for good plant growth. It is better to really soak the pot thoroughly than to water lightly every day. Soak the pot until water runs out of the drainage holes. The choice of containers is vast and up to individual tastes. Fiberglass and resin pots are the easiest to deal with because they resist cracking in the winter and are light weight. Ceramic pots are very attractive but are very heavy and can be very fragile. No matter what pots you choose adequate drainage holes are essential. The old idea about putting gravel or broken pot shards in the bottom of the pots is bad advice. Styrofoam peanuts can be used in the bottom of the pot if you want to reduce the weight of the pot and don't need the extra depth of the pot. It is always a good idea to cover the bottom of the pot with a piece of landscape fabric or some fiberglass screening. This keeps the drainage hole open and prevents slugs or other pests from entering the drainage holes. Matching the size of the pot to the hosta is also important. A small hosta in a large pot is a recipe for disaster. There should be no more than four fingers of width between the root mass and the pot wall. Once the roots fill the pot move it into a larger pot. What to do with the pots of hostas in the winter is also a frequent question. I am not about to throw out a pot of hostas come the winter, so learning how to overwinter the pot is essential. In my experience freezing is not what kills a pot of hostas. It is the constant cycle of freezing and thawing that causes the problem. If left outside in a pot a hosta will probably not survive the winter. The pot freezes and then the temperature warms up, it rains and the crown of the hosta is in contact with water. It will quickly become a mass of rotted roots. Instead take that pot and move it into an unheated garage just before freeze up. Put the pot away moist but not soaked and leave it. Even if it freezes and thaws a number of times throughout the winter it will be fine. The freezing and thawing happens very slowly and there is no contact with standing water. Being on the dry side when the roots are dormant is seldom a problem. In the spring the hostas will likely start to shoot earlier than those in the ground so it might be necessary to move the plants in and out of storage for a little while to prevent the emerging shoots from becoming too lanky. Some gardeners who don't have access to an unheated space solve that problem by moving the hosta from the pot, digging a hole and dropping the root mass in the ground. Pack soil around the root and then cover it with a thick layer of leaves. A vegetable garden often makes a good spot to use for winter storage but any spot in the garden will do. One smart gardener digs holes right under the pots and covers the hole with a sheet of plywood. The pot sits on top of the plywood. Mulch covers the plywood so it is not visible. Come the fall the hosta is removed from the pot and dropped into the waiting hole. Pot and plywood are stored until next year. Some gardeners collect all their pots together in a sheltered site where snow gathers. Dry leaves are piled over the pots after they have frozen and then white plastic is added to keep winter wet away from the pots. Be sure to put mouse bait in pet proof traps wherever you store potted hostas because a family of hungry field mice can wipe out your entire collection of potted hostas. Try a few pots of hostas in containers this year. If you are nervous about using a high priced hosta there are always divisions of overgrown hostas that you can experiment with. You'll find out how wonderful they look and how easy they are to grow. It may be the start of a new way of shade gardening.